Visiting the ancient site of the city of Xanthos, one of the largest and most prominent cities of the Lycian Federation, should be included in any yacht charter itinerary while cruising on a yacht charter along the southern coast of Turkey, especially for those with an interest in history, archeology, or just a plain interest in life. 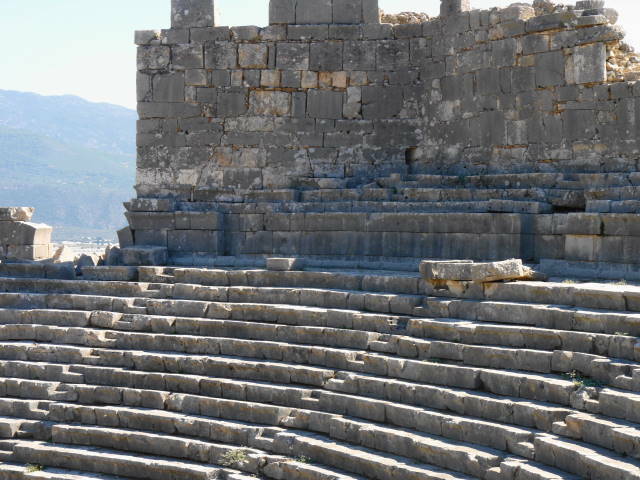 Xanthos as an inhabited city dates back to at least the 8th century BC and today is a UNESCO World Heritage Site. If your yacht charter itinerary includes a visit to Kas, Kalkan or the Kekova area, it is just a short drive to visit the ancient site of Xanthos while on a yacht charter cruise in this area. 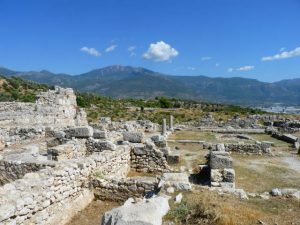 The Lycian Federation, a group of democratic city states, flourished along the southern coast of Turkey during BC history in the area predominantly between Dalyan and Antalya for many centuries until being overrun, city by city, by Persian, Greek, and Macedonian forces under Alexander the Great. And although under various different rulers of various different invading forces, the Lycian culture continued in this area for many more centuries, left fairly undisturbed other than each city paying tithes or supplying men for battle. 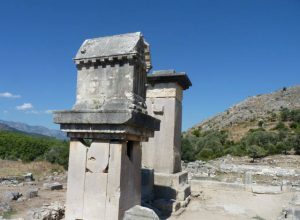 View the fifth century BC Xanthian Obelisk, a tall pillar tomb with the longest Lycian inscription in existence on all four sides, which helped modern scholars break some of the code of this archaic, difficult language. The Harpy Tomb, of the same era, sits upon a massive base, and is a grave-chamber. Its’ name is derived from the Greek mythological harpies, creatures with the head of a woman and the body of a bird, because of the winged women figures in the frieze. 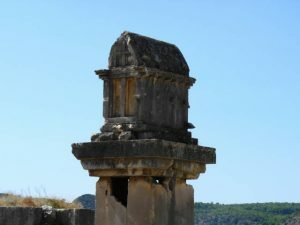 The Pillar Tomb is unique in Lycia with a normal Lycian sarcophagus standing upon a shorter pillar tomb. This tall tomb dates to the 4th or 3rd century BC. 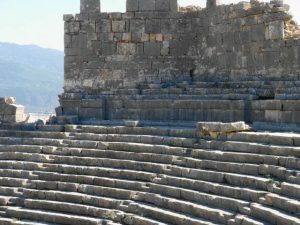 The Amphitheatre dates from the 2nd century AD. Only the upper rows of the structure are missing and the stage building is still partially standing. It was once two stories, decorated with columns. The Acropolis, situated above the amphitheatre, includes ruins of a temple dedicated to Artemis and the foundations of a large structure thought to be a palace that was destroyed by the Persians. The Acropolis offers grand views of the entire valley and river. The recently excavated Roman-Byzantine Street behind the amphitheatre outlines an area once lined with shops and thought to be the Agora area. Within the many foundation outlines, mosaic floors and other stone work have been found. Much of Xanthos is still to be excavated as this area was extensively settled and inhabited over many centuries, however a visit today especially when in the area on a crewed yacht charter is well worth the time to see that which has been excavated and to understand the extent of the site still to be excavated.